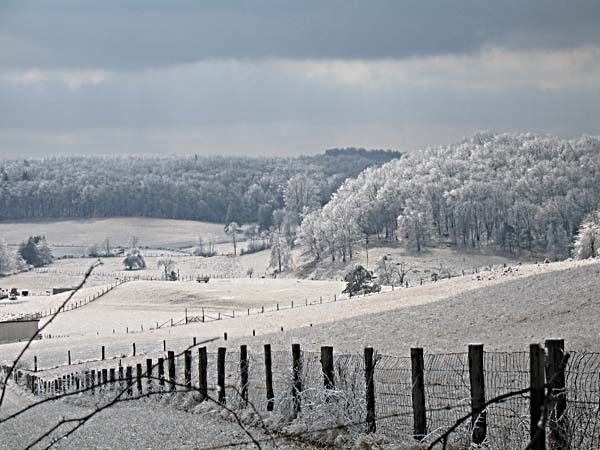 Now that my power is back on, I am able to upload the images that capture the feeling of the recent ice storm, as it appeared in our part of Floyd County. I could also use a little of that Global Warming right now because the temperature has remained below freezing for at least a week. Ice collected on every surface and kept accumulating over a period of several days because the temperatures stayed well below freezing even when we had rain falling from the sky. 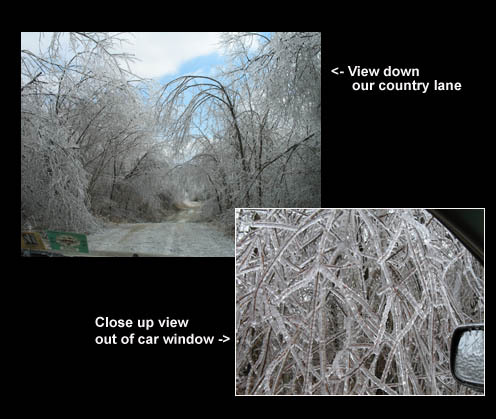 Unlike other ice storms I have seen, this one covered the landscape for several days. 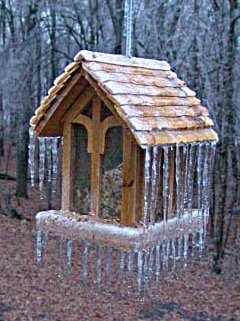 From bird feeders to entire farms, the world was captured in a crystalline mantle. Strong winds made it hazardous to venture out as there was a constant shower of ice from the swaying trees. I took a video clip of the ice-covered trees swaying in the wind and you can hear a chorus of creaking limbs and tinkling shards falling as the overloaded trees were driven back and forth. 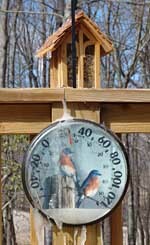 After the second day, there was more than ice falling. Our street was blocked several times by falling tree parts, but neighbors with chain saws made short work of the barricades. We had a few days of roughing it without running water or electricity, but we kept our spirits up by swapping storm stories with friends and neighbors. Our good friends Doug and Amy Thompson touched our hearts by inviting us over to use their shower after hearing that we were roughing it. I can tell you that hot water never felt so good! After power was restored and the roar of the generator died away, Gretchen started tackling the immense pile of dirty clothes that I had created while trying to keep the generator and wood fire going. It seemed that everything I wore ended up smelling like gasoline. 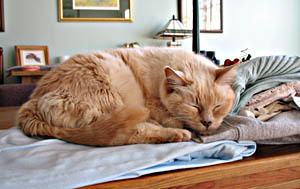 While we were occupied with cleaning up after the storm, Buffy did her part by holding down the pile of folded laundry. It’s a tough and demanding job, but somebody has to do it. Thanks for these amazing pictures! As a former Minnesotan now living in Saudi Arabia, I actually crave storms like the one you recently had just for their sheer beauty! (hehe tho my memories of power outages and being stranded in blizzards are still pretty fresh!) Thanks again and continued health for the rest of the winter!